LibriVox is a no-cost service that makes public domain books (books with expired copyrights) accessible in an audio format. The recordings are made by non-professional speaker, so you won’t be listening to Clint Eastwood or Maya Angelou. The service is volunteer-run, and you may need to search the website for a while. But if you’re patient, you’ll find nice options in the classic books’ genre. 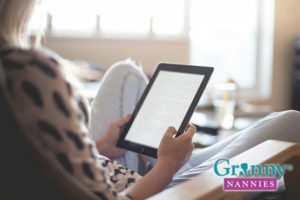 If your elderly friend is the type that wants the hottest bestsellers or books you can’t find at the library or on LibriVox, then consider purchasing audio books. The leading online companies that offer audio books for sale are Audible (an Amazon company) and Audiobooks.com. Simple to use, the books are downloaded to and played from apps on computers, smartphones, and tablets. Right now, both services run about $15.00 a month. File that in the brain stimulation part of the budget. Not sure if this choice is the right one for you? You most likely can request a free trial for a period of around 30 days that lets you download a book for free. This time period will also let you gauge how long it takes you and your silver-listener to get through a book. If the trial phase is a success, both services will start charging you a monthly subscription fee that includes a book a month. Not surprisingly, more than one book costs extra money.